The quenching & tempering process as per Thermex® makes use of the heat energy of the rolled bar after the finishing stand of the rolling mill. Normally, this energy is wasted as the rolled bars at 950-1000 0C are allowed to cool to ambient temperature on the cooling bed. The Thermex® process is a sophisticated and precise technology that has been developed after years of trials and tests. Fig. 1: Thermex® System in a rolling mill. The bar as it leaves the last stand is guided through specially designed proprietary Thermex® Pipes wherein the surface temperature of 950-1000 0C is brought down drastically in a relatively short period of time - approximately 1 sec - on account of the intense and uniform cooling. 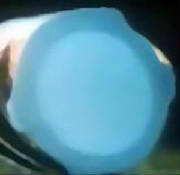 The temperature of the core is largely unaffected. The name THERMEX is derived from thermal exchange and this exchange is the key to the process. The drastic and pre-determined cooling of the bar periphery transforms the peripheral structure to martensite and would necessarily need to be annealed to render the bar useful. This annealing is achieved through the heat available at the core. 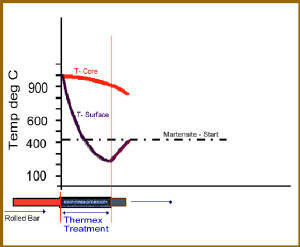 The peripheral and core temperatures finally equalise at around 600 0C and the resultant bar structure is of tempered martensite at the periphery and of fine-grained ferrite-pearlite at the core. Generally speaking, the resultant soft core forms about 70 – 80 % of the area (depending upon the desired minimum yield strength) and the rest is the hardened periphery. The product exhibits high yield point, surface hardness, toughness, ductility and weldability. 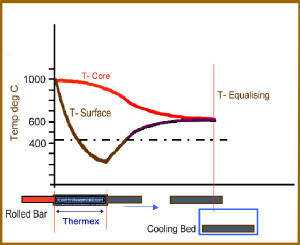 The thermal exchange in the quenching and tempering process is depicted in diagrams Fig 2a and 2b. The specially designed Thermex® pipe assembly consists of chambers, nozzles and guide inserts, venturi guide etc. The pipe is designed in such a way that high pressure water jets flows in the rolling direction, creates uniform water pressure all around the surface of the bar, and keeps the bar floated in guide inserts when it passes through the Thermex® pipe. The result is the uniform intensive cooling all around the surface of the bar. The final product cross-section is shown alongside in Fig.3. Fig.3 Note the uniform hardened periphery and soft core.